Then it was Alex Ovechkin’s turn. 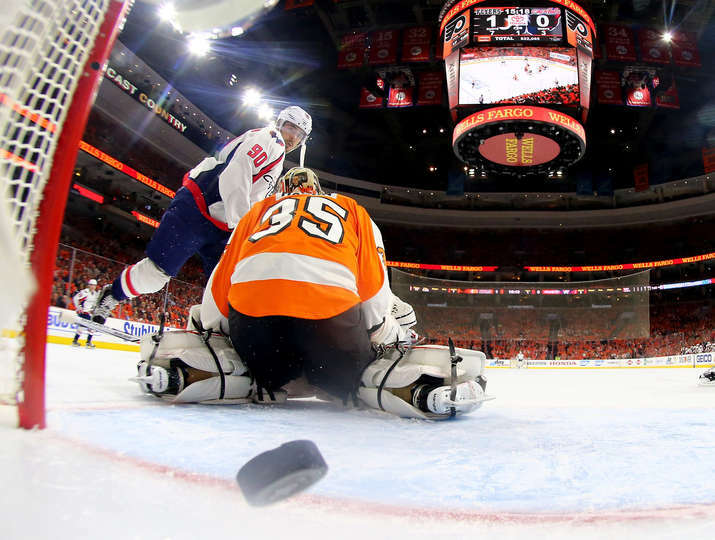 Picking up a puck in the neutral zone, skating just into the right circle and taking what may be described as a relaxed slap shot that goaltender Steve Mason misplayed, Ovechkin got his first of the night. Just like that, Ovechkin added a much needed goal midway through the second, scoring his ninth goal in the last nine games played, providing what would be the game-winner to key the Caps to 3-0 in the best-of-seven series. The insurance goal came at the 1:58 mark of the third. Braden Holtby decided to contribute on both ends of the ice when he launched a hard pass to Justin Williams, who was standing at the blue line on the Flyers’ end. Wiliams then launched a shot at Mason, who was unable to corral the rebound, allowing Evgeny Kuznetsov to sweep in for an easy goal in front. To put the final nails in the coffin, Carlson turned up for his third power play goal of the series from the exact same spot as in the first two games, slipping a snapshot from the point while Justin Williams made noise right in front of Mason. Ovechkin’s assist was his 73rd career playoff point for the Caps. From there it was chaos. After Pierre-Edouarde Bellemare took a five-minute boarding for a questionable hit against Dimitri Orlov, fists started flying. By the end of the penalties, the Caps were able to coast for nearly the entire final seven minutes of the game with a one-or two-man advantage. It was during that time that Ovechkin added one more soft goal, and Jay Beagle somehow stuffed it in from in front of the net to seal the score 6-1. The worst moment for the Caps came when Brooks Orpik went down after a hard hit from Ryan White on the boards. Orpik appeared extremely disoriented as he got to his feet and needed two men to help him get of the ice. A status update is expected on Tuesday. And Braden Holtby? It goes without saying that it was another great game from the netminder, who had 31 saves on 32 shots in what was, ultimately, a game that resembled pure mayhem and not professional hockey. NEXT GAME: Game 4 is Wednesday in Philly at the Wells Fargo Center at 7 p.m.